Take time for yourself-- so you can re charge your energies. 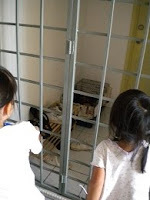 En 's ambition was an author before she changed it to be an animal trainer after she came back from singapore last month. She wants to be an author because she loves to write. Tonight, the author in her has returned! Each time a book is created, Hui's name will be included. En signalled me how the tadpoles swim and stop, swim and stop. Flower basket and rose petals. Flowery head band and veil. 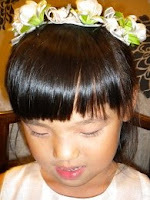 Left- Dress of 'Flower Girl brand' has lots of variety and much cheaper. 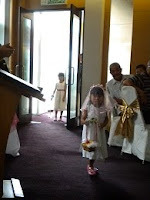 Both girls were beaming with joy and excited being flower girls for the first time! There was no rehearsal and I briefed them once at the restaurant. 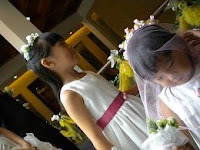 A day before the 'big' day, I showed them flower girls wedding march on youtube. They both looked stunning and did a great job marching in. 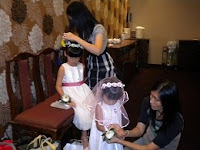 Left- Dressing up flower girls. 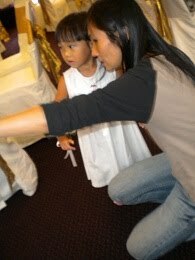 Right- Me telling Hui how to march in. Left- Flower girls waiting behind close door with bride/groom. Right- Hui marched in, follow by En. Dad brought home some boxes requested by En. She designed a home and got dad to cut accordingly. Left- Entrance - En creeped in. Right- Passed thru the living room. Where is she? Not in the kitchen! Top view of the house. 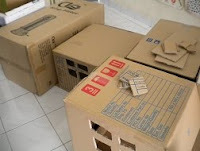 En commented the house is too small, so it belongs to Hui. Walking in. Made a left turn after the entrance. Left- Beautiful white flowers on a tree. This is where dad caught the fishes. En caught some water plants for our tadpoles @home. When the sun is blazing, EnHui cycle at the corridor [ It's me who dislike going out when it's hot :( ]. 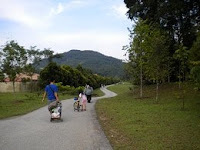 They cycle from our end to the other end, check on the two rabbits(at one unit) and back to our end - to and fro. After 11 days, tiny leaves popped out! A sight that excites EnHui bouncing up and down. How I wish I could easily laugh and bounce like them. :) Related Link. 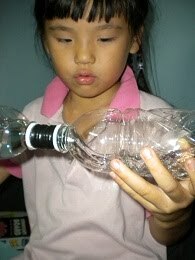 Give the bottle a swirl and see a spinning whirlpool effect, known as the eye of the hurricane. En said 'I am simulating tsunami". Early in the morning, En locked herself in the room. That's what she does when she wants privacy to do stuff, ever since Hui could turn the door knob. She came out with a satisfied look, proudly showed me what she had done. She explained the detail of the craft. Shortly, her expression change to bitter and she shyly mentioned "Fai didn't allow me to use his weapon. He told me I could see once and if I want to use, make my own weapon. So I made my own. He said use only grey color or black. But I still added pink because I like it." Left- Front side of shield. Right- Front side of weapon. Left- Back side of weapon. Right- Back side of shield. When she showed me the craft, on hindsight, I am glad I stopped what I was doing in the kitchen, looked at her and took time to listen. Everything that she said is important to her. At that moment, I acknowledged her feelings and as a result, I think she got over her disappointment. What if I simply give a short reply instead and said "yeah. good job" and turn away. How would she feel? What will she become? I have no idea. But I am sure glad that I stop to listen. What luck! Tonight, Hui slept much earlier. I finally got to allocate "En&Me" time for her. En suggested we do some craft. So, a 'spy-headquarter' door sign it is, from How to Be a Spy in 7 Days or Less ! She is still so attach to this book and even asked to meet with a real spy! 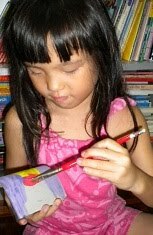 When we have done painting, she grabbed the crayon box, papers and moved on to drawing/colouring. I just followed her lead and joined in. Tonight, I felt a deep sense of joy, enjoying every moment with her. I realised I have not been able to spend time alone with her for quite some time. I saw how patient she is, waiting for my time and how impatient I could be, when I waited for her. Left- En painted the sign. Right- a painted frame, cut-out from a cereal box. Left- the page of the door sign craft. Right- My crayon work. Left- En's crayon work "eggs". Before bedtime, she checked on the pressed-leaves that she created on 8th April 2010. On 8 April, En collected and pressed some ixora leaves. We did a pressed ixora flowers before and she loves the outcome, all flat and nice. We pasted it on card to make a bookmark. Now, she came out with the idea of pressed-leaves. Step 1 - En laid the leaves on a piece of tissue. Step 2 - Put another piece of tissue on top of the leaves. Step 3- Slide it in between the pages of thick books. Check after 14days. Before En went to bed, she said "I love you, mommy" and asked for a hug. :) What a great night it was. 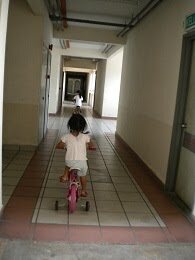 It's so so important to allocate 'private' time for each child!